After over two years of development, we are pleased to announce the release of our JHM B6-A4 3.0L Tiptronic Transmission Tuning!!! The JHM TCU Tuning for your Automatic B6-A4 3.0 makes your Tiptronic Transmission shift faster and harder. We firm up the shifts to give a clean and crisp gear change that is faster and firmer than the stock characteristics but still not too abrupt. 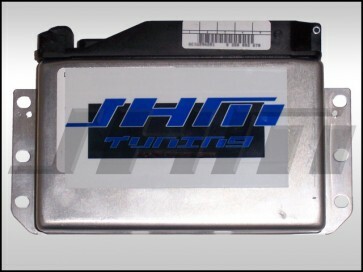 We feel our JHM TCU Tuning makes the car shift how it should have from the factory. It gets rid of the sloppy and slow slipping of the OEM TCU calibration and replaces it with firm, crisp, shifts. This allows you to get the most out of your Tiptronic B6-A4 3.0L by allowing you to put the power to the ground faster. To see our tuning in action, feel free to check out the video below. The B6-A4 3.0L car featured in the pull against the 1.8T Audi has the JHM TCU Tune along with our JHM 2.5" Stainless Steel Downpipes. Our TCU Tuning not only speeds up the shifting on upshifts JHM also modifies the downshifting characteristics and the behavior in "Tip Mode" to make the car more performance oriented while still being very streetable. We also improve the downshifting as well, we have been told it feels "less clunky".In our development for the TCU tuning we made a few different calibrations that could make the transmission shift harder, but we found that this made the car feel too much like and old muscle car, and less like an Audi. When you increase the power of the vehicle, the slipping and sliding of the OEM calibration will prematurely wear out the transmission. While it may be comfortable, the slipping of the transmission means that all of the clutch packs in your transmission are doing more work and slipping more, wearing out faster. The faster and firmer shifts prevent this wear by decreasing or eliminating the slipping. HOW TO GET YOUR TCU JHM TUNED: As of September 2013, all TCUs must come to JHM to be tuned. We are working on flashing capability for the B6-A4 3.0L TCU. Order your tune by selecting your vehicle from the dropdown menus below. Please select year and body style of your car. Once you've selected your vehicle setup, add this product to your cart. Once you've added the tune (and any other items you'd like to order) to your cart, please proceed to checkout where you'll be prompted to select a shipping method. This will be the shipping method JHM will use to ship your TCU back to you after we have tuned it. If you're ordering items in addition to your TCU tune, please let us know if you would like us to hold those items until we receive your TCU. After completing your transaction, please print out the order confirmation page that is generated by our online store or the order confirmation email with your order number on it. This will be a five-digit number starting with a 2 (eg. 22341). When you send in your TCU, please make sure this printout is included in the package. This will help us to quickly identify your TCU, tune it, and get it re-packaged and ready for shipment back to you! **NOTE: When you ship us your TCU, we highly recommend insuring it for at least $400. We will insure it for $500 when we ship it back to you. If you are shipping your TCU to us from out of the United States, please mark your package as a warranty or repair item. Import duties that we pay on a customer's behalf will be charged back to the customer.